justthefood.com...the blog: Gearing up for Game Time! The only meat I miss from my non-veg days are chicken strips. Your Toffalo Wings remind me of them so much! I haven't tried your recipe, but I will! If you really want them to taste like chicken, try using Gardein instead of tofu! Even Rachel Ray has to say 'Yumo'. I was once vegetarian for couple of years but I found it was hard to control my weight. I really enjoyed the veggie days and one day will try again! I will try your Toffalo wings for sure! Three words: that looks amazing! I have to say, these are one of my favorite recipes ever! I found them a couple of years ago on your blog, and they are now in regular rotation at my house (i.e. Weekend Wings). The coconut milk in the batter is awesome. Thank you!! Hi Joni! I have recently found your blog and was busy perusing the other day and spied this lovely recipe. You made a lady and her hubby very happy on a very lazy Sunday afternoon. 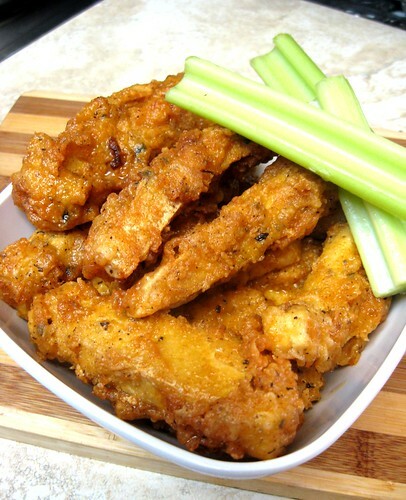 Dinner was made super fast and we thought how super tasty these Toffalo Wings were. I have to admit to not following the spices but I definitely followed the principle and they came out great! I think these might become a bit of a staple in our house and that will make my man a happy camper. Thanks so very much! Those look fan-freakin-tastic! I'm totally going to give them a try the second I get over my fear of boiling fat on the stovetop. Just made a batch in a Presto Multi-Cooker. As someone who frequents all you can eat wings nights, I still found these to be very tasty. I used corn starch instead of flour but still turned out well... weren't soggy & bland in the middle like other tofu wings. A little trick I found to be pretty cool is to take your drained, pressed, tofu and brush it with Better Than Bouillon No Chicken Base. Since tofu has so much water in it to begin with, I don't dilute the base--just brush it straight on and let it sit for a few hours until you cook it. Start out lightly because it can make your dish super salty, but once you find the balance that you prefer, it's a great trick to add a new level of flavor to any dish you want. I second Joe Byer's tofu seasoning approach except that I freeze my tofu first, thaw, drain and cut into slices then marinate in boiling Not Chick'n bouillon cubes and water with minced garlic and poultry seasoning and pepper for about 15 minutes. I don't drain again, I press lightly on both sides excess broth on the outside so that it won't pop in the oil. The freezing them and then boiling marinade gives it an amazing texture and flavor.